Applying for a mortgage is a straight-forward process. When you are prepared, it is unlikely you will receive any surprises. A mortgage lender needs information about your work history, debts and assets to establish your credit worthiness and ability for repayment. The bank will establish your gross income and potential payments and property tax expenses to arrive at a Gross Debt Service ratio (GDS). This is usually limited to 30-35% of your gross income. Debts will be added to establish a Total Debt Service ratio (TDS), which can't exceed more than 40 percent of your gross earnings. Can you make your scheduled monthly payments? Second, if you default (don't make your payments) can the proceeds of the sale of the home cover the cost of the loan? To answer these questions, a lender will ask about your net worth. This is the difference between the value of everything you own and your debts. They will consider your bank balance, investments, real estate holdings, vehicles, debts, and credit card balances, along with your employment history. The lender will also review your credit history. This shows your ability to repay your mortgage, as it indicates how you have handled past debts or become insolvent (bankrupt). You will be asked to sign a form giving the financial institution permission to obtain information from your employer, creditors and credit rating agencies. 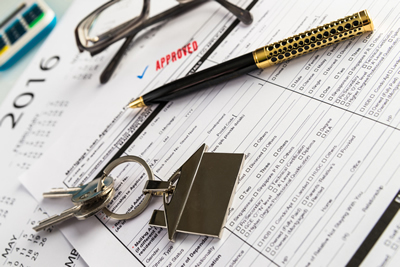 You may want to check your credit history yourself, before you apply for a mortgage. This way, any problems can be corrected and you won’t be turned down for a mortgage. You can request your credit history by contacting Trans Union or Equifax, two of the major credit bureaus. You will need to make a written request for your history. Send a letter asking for your credit history, along with photocopies of two pieces of ID with your current address, plus a photocopy of a utility bill or credit card invoice. The process takes about two weeks and you'll get a good idea of how you will be evaluated by the banks. Resolve any outstanding debt issues and ensure that any errors are corrected. If your down payment is less than 25% of the home, it is legally required that you purchase mortgage loan insurance. In Canada, most lenders are legally required to insure a high risk mortgages. If you default on your payments, the lender receives their money from Canadian Mortgage and Housing Corporation (CMHC) or other insurer. With this federal government guarantee, most lenders are confident in financing up to 90% of your purchase. Fees for this insurance run between 0.5% and 2.75%, and are based on the size of the loan and value of your home. Premiums can be paid as a lump sum when you make your purchase or as part of your monthly mortgage payments. Additional fees include application and appraisal fees.